Hugo is introverted and quiet and likes very much to be cuddled by his nanny. He is very attached to his nanny and he loves it when she sings him songs. Hugo will hum along to songs others sing. He likes to play with toys and watch the other children play around him. He is a very determined little boy and he will work patiently and vigorously to improve his physical development when in rehabilitation training. 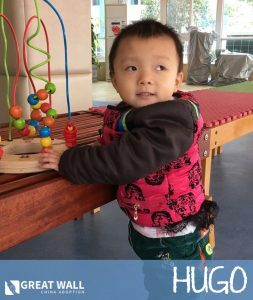 You can contact the China Home Finding Team at Great Wall if you would like to learn more about adopting Hugo. We hope we are able to find Hugo his Forever Family soon! McKray is a precious little boy from China that just recently turned 1 year old. McKray had hydrocephalus as a baby but he received surgery to have a shunt put in when he was 6 months old. He also has cerebral dysplasia which causes McKray to have some developmental delays. At this time McKray can roll by himself over but cannot sit up or crawl. McKray cannot currently hold toys in his hands. He cannot currently speak and he does not react when someone calls his name. McKray is a quiet little boy who likes to smile and laugh. 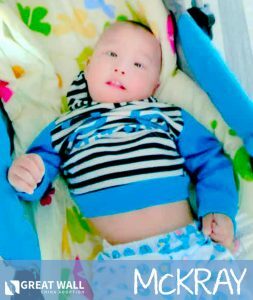 You can contact the China Home Finding Team at Great Wall if you would like to learn more about adopting McKray. We hope we are able to find McKray his Forever Family soon! Rose is a sweet little girl from China that is 5 and a half years old. She was abandoned when she was 2 years old and taken to the orphanage at that time. Her birth date was estimated based on when she was found, so it is possible that she might be a bit younger than 5 and a half years old, but there is no way to know for sure. Rose’s left eye is somewhat malformed, and she appears to have only light sensation in her right eye, so even though her vision is poorer than other children, she can see some shapes and objects. She is delayed because of her vision issues, such as speech and some self-care skills. Although she is not completely blind, she has similar delays to a child that is fully blind, which is why she needs to be adopted soon to get the proper care and attention she needs to thrive. Rose is able to walk on her own and get around by herself and she has good balance. She does need the help of her caretakers to go up and down stairs. She needs help to dress, undress and go to the bathroom. She isn’t very talkative but she does understand what other people are saying and she follows the instructions given to her by her caretakers. She loves being cuddled by her caretakers and she will let you hold her for as long as you want. She likes to play with toys that have sounds or have unique textures. 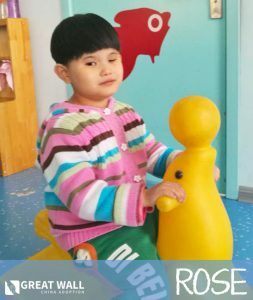 You can contact the China Home Finding Team at Great Wall if you would like to learn more about adopting Rose. We hope we are able to find Rose her Forever Family soon! This is Neil! Neil is a 9 year old boy with Hemophilia. He is described as being very clever and he picks up quickly on new things. He is very independent and is often found helping other children. Neil is extroverted, friendly and polite! He loves to sing and play outside with his peers because he excels in sports! Due to his hemophilia, Neil goes to school inside the institute. He has great cognitive abilities and is great at completing his math problems. 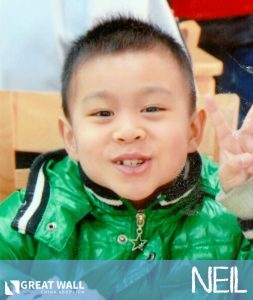 Neil’s file indicates that he is very eager and happy at the thought of being adopted by an American family. We hope Neil can find his forever family very soon! Contact one of our matching specialists today if you’d like to review his file!